The main screen shows a list of games which are available to play. The top section shows games you have created and the next area down shows any games that other users are sharing with you. 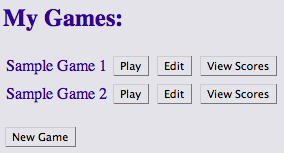 For games that you've made, you can play, edit, or view scores from previous times it has been played. For games people are sharing with you, the only options are to play and view scores. You can not edit games which aren't yours.